With its ancient culture and the Himalayas as a backdrop, Nepal has long been the destination of choice for travellers in search of adventure. Land locked between the high plateaus of Tibet to the north and the hot, fertile plains of India to the south, Nepal is a land of ancient history, colourful cultures and people, amazing architecture and stunning scenery. Nepal is not just a trekker’s paradise, but somewhere that can cater to every kind of traveller. This tiny, land locked country can boast some of the world’s best white water, amazing mountain biking trails, fascinating old towns, magnificent temples, ancient traditions, ethnic diversity and history stretching back thousands of years, as well as opportunities to see highly endangered wildlife in the jungles of its national parks. Those who wish to explore the history and culture of this amazing country are spoilt for choice, with ancient and modern intermingled and every corner turned, offering a glimpse into a world barely changed since the Middle Ages. The Kathmandu Valley itself is home to no less than seven UNESCO World Heritage Sites – Kathmandu, Patan and Bhaktapur Durbar Squares, the Buddhist stupas of Swayambhu and Bodhanath and the Hindu temples of Pashupati and Changu Narayan. 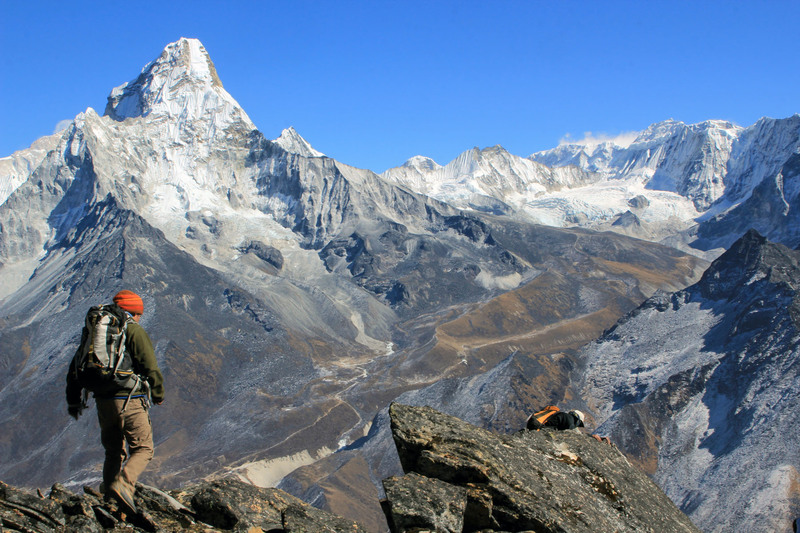 Trekking in Nepal is an intense cultural experience as well as an exploration of one of the world's most walker-friendly and spectacular environments. Home to 8 of the world’s 10 highest mountains, Nepal has a staggering number of routes suitable for trekkers of all ages and abilities stretching the length of the country from the boarders of Sikkim in the East to Uttar Pradesh in the far West. Home to four main trekking regions – Everest, The Annapurna’s and Langtang & Helambhu - the pathways you will tread will not only take you past some of the world’s highest mountains and through jaw-dropping scenery, but will envelop you in the spirit of Nepal and its people. As you pass through villages following traditional trade routes you will be given an insight into life in rural Nepal and marvel at the adaptability, resilience and tenacity of Nepal’s different ethnic groups. The Himalayas offer hundreds of trekking routes, many of which are unknown and left untrodden by your average trekker, in favour of the classic treks. Himalayan Quests, specialises in treks away from the crowds, enabling you to experience the solitude, beauty and unique cultures the mountains and their people have to offer. Many of these treks are sections of the Great Himalayan Trail,a trekking trail that runs through the entire length of Nepal’s Himalayan Range, from the district of Taplejung in the East, to Humla and Darchula in the West. Leave behind the stresses of everyday life and immerse yourself in the beauty and power of one of Nepal’s many rivers. Far more than just a high octane roller coaster ride full of water splashes, river journeys deliver pure escapism. As you tune in to the rhythm of the river, life slows down, your stress disappears, the adrenaline starts pumping and your focus becomes the simple and basic necessities of fun, sun, food and sleep. Camping on remote and beautiful riverside beaches, catching glimpses of the local culture as you paddle by, your journey will offer time for reflection as well as the thrill of taming (or not) some of the world’s best seat-of- the-pants, gravity powered and adrenaline pumping rapids. Thought of as the adventure capital of trekkers, mountaineers and white water enthusiasts, it is often forgotten that Nepal is also a haven for wildlife and offers amazing opportunities to see the highly endangered Royal Bengal Tiger, Asian One-horned Rhinoceros, Asiatic Wild Elephant and fish eating Gharial Crocodile. Nepal has nine National Parks and four Wildlife Reserves, in all about 15,000 square kilometers, amounting to almost 18 percent of the country. The Terai lowlands to the south of the country are defined by a belt of well-watered floodplains stretching along the Indian border and it is here that the jungles of Nepal can be found. This is the richest habitat in the Nepal with tall grasslands interspersed with riverine and hardwood Sal Forest. The two main national parks that offer the best opportunities for wildlife viewing are Chitwan National Park in central, southern Nepal and Royal Bardiya National Park in the far west. Why Explore. Discover. Experience Nepal? Despite its tiny size, what Nepal has to offer is anything but small, making it one of the best adventure playgrounds in the world! HQ specialise in treks that are off-the-beaten-path enabling you to experience the solitude, beauty and unique cultures the mountains and their people have to offer. As an organisation, HQ is aware of the fragility of the regions explored and seeks to improve and develop the communities they encounter, through the provision of jobs and education for local staff. HQ believes in an honest service, with no hidden costs or surprises, and through their work they help support Nepali children and communities in need by donating a percentage of their annual profits to projects run by local partners. HQ will create for you a tailor-made trip of a lifetime according to your requirements, budgets and timescales. Each itinerary is created to suit your interests and desires, giving you as much help, guidance or freedom as you wish, while maintaining the company’s responsible travel ethics. If you would like to travel in an area not mentioned on our website, or customise an existing itinerary we will happily accommodate your needs.